Lisa Taylor from Moneyfacts.co.uk – the money search engine investigates: “With the children’s summer holidays well underway and the UK weather showing little sign of improvement, many of us will be jetting off overseas in the next few weeks. With so many things to get ready, like shopping for your new bikini, sun tan cream and flip flops, no doubt these will all take preference to shopping for the best deal on your foreign money. “This year travelers will find an abundance of commission free currency deals, with only a handful of branch and telephone services now charging an up front commission fee. This is great news, as travelers will avoid paying these fees, which previously ranged between two and three percent of the order. However this now makes the exchange rate the key factor in determining the best deal. It is something that is not easily searchable without trawling individual providers’ website's or, even more time-consuming, making phone calls or visits to the branch. “Moneyfacts.co.uk latest travel money mystery shop takes a look at the online rates available at some of largest travel money providers. 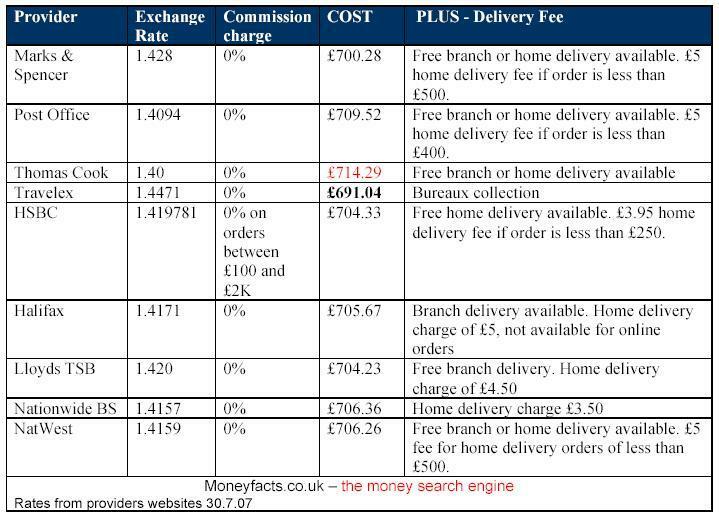 The tables illustrate the total sterling equivalent you would need to pay for either €1,000 or US $1,000. 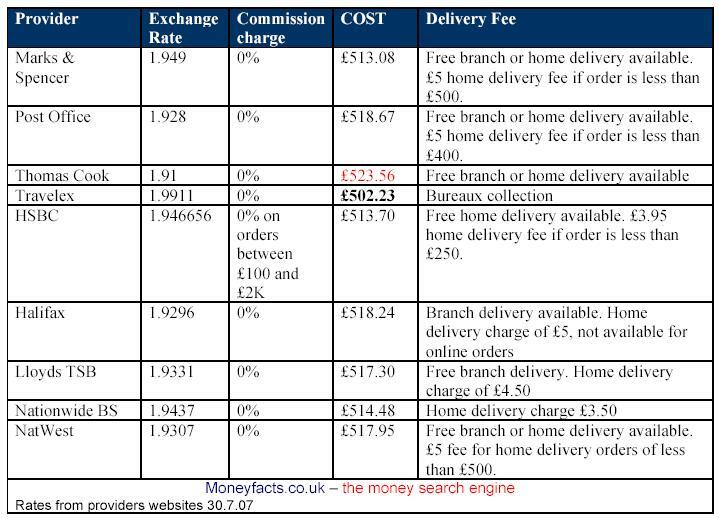 “By choosing carefully from the providers listed below, savings of over £20 can be made. And of course the more money you take, the larger the saving can be. 4. Many providers will still charge a commission fee for sterling travelers cheque's, which typically ranges between 1% and 1.5%. So check out the commission rates too.